I wasn’t surprised at all when I read this article about a San Diego Padres fan being struck in the chest by a foul ball. Although neighboring fans moved out of the way, the injured spectator was trying to update Facebook and didn’t notice the ball speeding to his section. Studies have demonstrated increases in injuries to pedestrians who text and we all know the hazards of texting while driving. This is another example that smart phones may really be making us dumb. For many of us, technology has been integrated into various facets of our lives longer than it has been playing a role in healthcare. Because of it, some of us are losing essential skills. Now that GPS navigation is widely available in vehicles and on phones, people seem less likely to know how to read a map or use a road atlas. On family vacations when I was a kid, I looked forward to driving across the state line so we could stop at the visitor’s center and pick up a map. We always had a stack of maps from various states in the glove compartment which were great to look at while on long trips. Technology can be great – it’s definitely safer to have a cell phone in case of emergency than to have to walk down the road to find a pay phone which may or may not be in working condition. It’s reassuring to have allergy and interaction alerts in my electronic medical record rather than relying on memory (as if one could actually know every interaction out there – cytochrome P450 haunts my dreams.) But does relying on the system hamper our desire to actually learn and retain the information? I thought I’d be immune to it by now, but as a primary care doc, I’m still amazed at people’s dependence on technology. The other day, I walked into an exam room where a patient was scheduled for a gynecological exam. I generally run on time and actually had to wait a minute after I knocked because the patient was still changing out of her clothes. I could barely make it into the room because the patient had rearranged the chairs to allow her phone charger to reach the outlet. She also unplugged the exam table, making it impossible for me to perform her exam without plugging it (and the lamp) back in. She was already texting by the time I entered the room and I had to ask her to put the phone down so we could conduct the visit. I see countless parents who can’t put their phones down long enough to talk to me about their children. What message do they think they’re sending? Unfortunately, the kids develop the idea that what’s on the screen in the virtual world must certainly be more interesting than the real world. They think it’s normal to be connected to the office 24×7. When we’re rounding in the hospital and we’re focused on our phones rather than interacting with nursing staff and the care team, it’s no different. Conversely, trying to interact with members of the team while they’re texting or taking personal calls isn’t a good thing, either. At a local youth camp where I volunteer, we have detailed emergency preparedness plans and the staff monitors conditions so that we’re ready for severe weather. Nevertheless, parents are still glued to their phones watching weather radar in case it might rain rather than seeing their kids do fun things like archery and horseback riding. I watched one mom tell her son that he needed to get back in line to do archery again so she could take a picture because she missed him doing it the first time. Why did she miss it? She was on Facebook posting pictures from the morning’s activities. With obesity and lifestyle-related diseases on the rise, it’s even more important for each of us to put down the technology for some part of the day. Try driving without the GPS and actually take in your surroundings. Or, get outdoors and let your brain recharge or give your body some needed activity. Reclaim your critical thinking skills and your sense of wonder rather than letting technology define your world. Can you name the location pictured above (courtesy of Jake DeGroot) or do you know its purpose? Email me. I still dont see the need to carry my smart phone everwhere I go. There are very few things thaqt need an imediate response, 24/7..at least those I could actually impact. But I am continually being harassed by others that they could not contact me, and had to leave a message….Then i watch kids that have their text screens attached to their eyes…Imagine shutting down all cell/internet for a weekend…very scarey. Also have an excellent internest, but he reads the forms on the PC and asks the questions never looking at me. Always willing to spend as much time as I need with him, but this still bothers me. Did your phone geotag the picture? If so, send me the coordinates and I’ll look it up for you. Photo: is that the defense bunker of the last provider in our organization who refuses to use the computer? It could also be the home of Mordac. But what do I know? Technology is evil. Yeah, and its guns that kill people. Boyoboyoboy. I have seen people almost be hit by a car because they were texting or talking on the phone and not aware of their surroundings. In today’s busy, busy world we all need to disconnect from time to time, stop and smell the roses and, hopefully avoid being killed!!! I really appreciate this post. About a year ago I removed Facebook from my smartphone because while I was trying to stay connected I found I was out of touch with my 3D environment. I can still find an address by the address pattern, though I Google map a lot. Two weeks ago I went off the grid to go camping in the mountains with family. It remains the best recharging activity I can imagine. That’s the Harney’s Peak Lookout tower for forest fires (and I knew that without clicking on the picture, which shows the name :)). 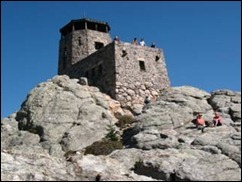 http://livingnewdeal.berkeley.edu/map/view.php?&l=1380 Lots of interesting facts about Harney’s Peak and its significance to Native Americans, especially to Black Elk. It’s a shame that within the last 20 years they have really developed the area commercially…prior to a huge parking lot and paddle boat lake being installed, it was a great primitive campground with 3 giant pillars of granite rising out of the small lake. It was no wonder the area was a significant spiritual center for the Lakota. Beautiful! God bless you! I predict that your patients of the future will be the deaf and near sighted children of today whose life was spent focused on a screen with headphones embedded in their ears. Thanks for this post, Jayne. Once my wife’s teenage second cousin watched our two young kids while we went out on a much-needed date. When we returned, our 18-month-old son was on the floor screaming and she was absorbed in composing a text message, oblivious. I fear that over-reliance on burst communication and social media sites are killing the ability of the next generation to hold a conversation, structure and defend a line of argument or write a cohesive article (let alone a book!). Why can’t people keep eye contact when talking to you? Because their eyes are looking for the latest update about nothing on their phone. I recall a funny Seinfeld skit in which he observed that it would be considered rude to read a newspaper while talking to someone, so why is it accepted practice to do the same with a phone or tablet? What are the ramifications going to be of such shifts in inter-personal communication? This cynic predicts they will not be positive. You are spot on. I really do get irritated when people can’t turn off their phones and PDAs to have a simple conversation. Although a few months ago I was in the waiting room getting ready to have some foot surgery. Unfortunately at that time I was dealing with some health issues that my elderly parents were having and of course a physician’s office called just before I was going back to prep for surgery. I was in the wheel chair saying…”I am not one of those people…honestly” to the nurse who was taking me back. I’m sure he thought that is what they all say…but it was true. I really appreciated when you mentioned looking forward to getting a state map at each crossing along the way. I grew up with a mother who was terrified to fly so we traveled by car across the entire country. At 47 I have been to every state except Hawaii and this is largely due in part to my childhood vacations. I have found one use for my Smartphone on vacation that has worked out well for me and my 14 and 16 year olds. They roll their eyes when I want to stop and read a historical marker. The Oregon trail runs through our state so there are several of them. My kids finally suggested that I pull in, take a quick picture on my phone and then get back on the road. It isn’t perfect but I can say we were there and go back later and read exactly what happened in that particular spot. Sort of melding of the old and new.